A new bill to end the use of animals in cosmetics tests was introduced by Juan Carlos Losada in the Colombian Congress on Wednesday August 29, 2018. Championed by Animal Defenders International (ADI), if passed, it would see Colombia join nearly 40 countries worldwide with such bans in place. These include the UK, the first country to introduce a ban in 1998, India, Israel, New Zealand and the EU. 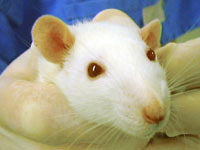 In the USA, The Humane Cosmetics Act seeks to phase out animal testing for cosmetics, and the sale and transport of such products. In May 2018, Members of the European Parliament overwhelmingly adopted a resolution calling for a worldwide ban on the use of animals in cosmetics testing by 2023. ADI is urging the Colombian Congress to lead the way in Latin America, and become the first in the region to adopt a nationwide ban. 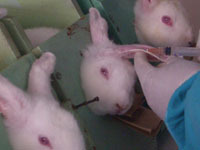 Investigations undertaken by ADI have exposed the terrible torment endured by animals in cosmetic testing, including racks of rabbits restrained in stocks while products are dripped into their eyes and guinea pigs suffering raw and inflamed skin lesions. If you live in Colombia, urge your congress members to support the bill today and sign the Avaaz petition calling for a ban. Outside of Colombia, contact the Colombian Embassy in your country, asking them to support proposals to end cosmetics testing on animals. Wherever you live, support this campaign for animals. 2 April 2019: VICTORY! The Plenary of the House of Representatives in Colombia UNANIMOUSLY approved the bill, which will now go to the Senate. 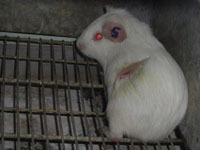 It needs to pass two debates to become law, and make Colombia the first to ban such tests in Latin America. January 2019: The Colombian government and National Association of Businessmen announced support for the bill, to ensure the legal protection of animals and enable Colombian businesses to more readily access the European market. Colombia is renowned in the cosmetics industry for its high consumption of products and export of its brands. Many multinational companies have facilities in Colombia to cover the Latin American market. Approval of the Bill would therefore have an impact on the Pacific Alliance countries, Chile, Colombia, Mexico and Peru. The Congress of Colombia will return a month early, on February 7, 2019 to discuss the National Development Plan. This is a priority issue for the country, defining the administrative direction of the government. ADI and fellow partners of the Animal Observatory are calling for the creation of an Animal Protection Commission in Congress, to lead on animal protection policy matters. December 2018: On December 11, the bill unanimously (15-0) passed the first of four debates at the Seventh Commission of the House of Representatives. ADI’s Eduardo Pena attended the session, along with the bill’s author, representative Juan Carlos Losada.